Topic: Has anyone with dyspraxia passed first aid? Re: Has anyone with dyspraxia passed first aid? Topic: Will Britain be able to make a sucess of Brexit? Re: Will Britain be able to make a sucess of Brexit? Your choice whether to drive or not is diddly squat of their business. Especially if the transport links for not driving are invariably the more effective way of commuting in London anyway. 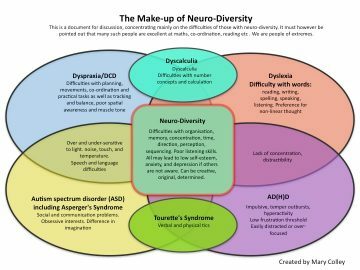 Checkout this graphic it shows how the various parts of the spectrum may overlap. I’m a life long Williams supporter... which is currently a tad depressing. But that’s how it goes sometimes. Topic: Hi there, I am new! Re: Hi there, I am new! Topic: ASD and dyspraxia- how much are they related? Re: ASD and dyspraxia- how much are they related? Topic: explaining dyspraxia to family or not? Re: explaining dyspraxia to family or not? I detect a tone of sarcasm in you. Look, I’m sorry that I hold a perspective not in line with your own. But this is a forum and we are free to express our views openly. I'm already aware of this. No new career should be embarked upon in your mid 60's. That's my point. How do you explain dyspraxia to a family who doesn't understand something that simple, that basic????? Yet some people do and succeed. Your point may be correct for you... it may not be for everyone.